A specialist in intellectual property jobs and career advice, IP Careers has developed a unique partnership with CIPA in order to produce the only official graduate career guide to Chartered Patent Attorneys in print and online. Moving forward, IP Careers have also been developing a new relationship with the Chartered Institute of Trade Mark Attorneys. Our aim is to provide students with high quality, structured career information written by industry experts that is both impartial and independent. Professional bodies and industry experts help to provide and approve our articles, ensuring that the guide offers the most authoritative information available. Central to our careers information getting into the hands of relevant students are careers staff who have shared our resources. You can read what your colleagues have said about us on our testimonials page. We distribute a limited number of our guides FREE to a some universities. There is also the option for universities to purchase copies at our Educational Provider’s Discounted Rate. However our guide is also freely available as a PDF. 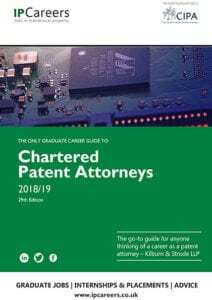 The PDF of the Chartered Patent Attorney career guide is available to download here. Our monthly newsletters include fresh content on the intellectual property industry, covering the latest news, career information and vacancies, all to be shared with your students. To receive these, simply fill in your details via our short sign-up form. Does your careers centre have an active twitter or Facebook account? Then connect with IP Careers to share content from our timelines. We regularly post about new and expiring vacancies, application tips and career-planning suggestions. We also have a LinkedIn group for Careers Staff. Join us and 500+ of your fellow professionals to stay up-to-date about our latest initiatives. If you’re looking for fresh, original content for your careers blog then we may be able to help. Our editors have written blogs for a number of universities, some examples of which can be read on our guest blogging page. We are particularly keen to help put together focused blogs on the professions we cover. One of the easiest ways to highlight our resources is adding links to your careers or departmental website. This could be as simple as just including a URL or have some text, a logo or image of our guides to go with it. We’ll leave that to you. Everything you should need is on our link to us page. If the above has not given you the resources or information you need then do please feel free to get in touch.